After reading Time Out New York’s article on the Top 10 Burgers of 2008, I knew it was time for NYC Food Guy to see if these burgers were worth the fuss. First stop: Telepan. The opportunity to eat this mini burger is only available as part of the 3 ($28) or 2 ($22) course lunch prix fixe or the weekend only 2-course brunch prix fixe ($28), which I indulged in. 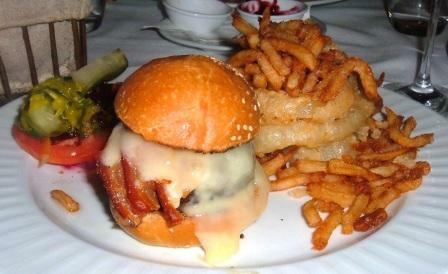 The burger is served with crisp bacon, melted white cheddar, housemade pickles, lettuce, tomato, crispy shoestring french fries, and an onion ring “volcano”. At brunch, you also get a complimentary housemade bread basket with some delicious cakes including a damn tasty cinnamon muffin. As far as the burger goes, harmony of flavor was lacking. My overall thought was “charred and salty.” My first course, the Semolina Cream Crepes with sauteed butternut squash and brown sugar sauce, were delicious enough to save the meal.